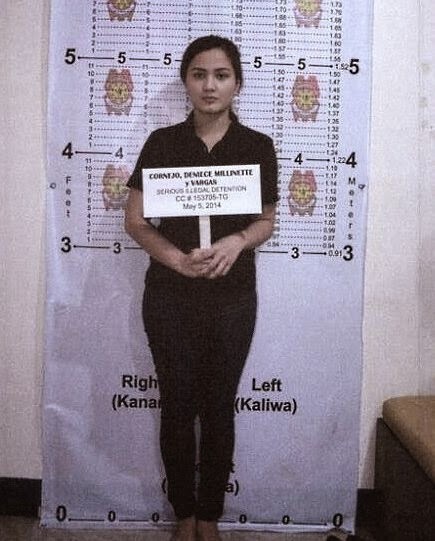 Manila - Philippine National Police (PNP) released today mugshots of model-stylist Deniece Cornejo, who surrendered Monday afternoon at Camp Crame, Quezon City to face the serious illegal detention charge filed against her in connection with the mauling of actor and TV host Vhong Navarro. Serious illegal detention is a non-bailable offense but her lawyer said they will file a petition for bail in court because the evidence against Cornejo is weak. Cornejo is spending the night at the PNP Criminal Investigation and Detection Group's Anti-Transnational Crime Unit detention cell with a number of fellow female inmates. CIDG head Chief Supt. Benjamin Magalong confirmed to ABS-CBN News that Cornejo will be brought to the Taguig Regional Trial Court (RTC) today, May 6.